Brynovation.com: Tweeting Brands - Will it scale? 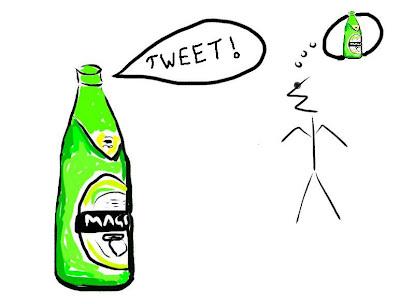 Tweeting Brands - Will it scale? So what do I see is the difference? What is it that brand marketers try to do? Well I presume it is to get a few simple things happening? Now before companies start to tweet they have presumably have their brand profile very clearly defined? With this in mind, the ones I see doing it best are the ones who are putting out their brand to their target audiences in the most subtle way. Yes, they can all offer feebies and competitions which yes to some extent will get people talking, but how long does it last. Is it known today and forgotton tomorrow? The ones doing it best are the ones that gain and keep followers, not just attract them with a shiny new competition. There is also the case of where brands are enguaging to stop anything negative or at least turning a negative into a positve. Take one company for example who i know are searching hashtags and general statements about their brand and due to the fact that they supply a service (rather than a particular off the shelf product) they seem to be very fast to react to anything negative. Is this conducive to scaling? I am not so sure as the percentage of Twitter users actually getting support via this method is relativly small, however, should users realise that they can get support by simply enguaging with the brand directly on Twitter the numbers would increase rapidly probably in turn breaking their current "AdHoc" Twitter strategy. This all being said however, I do believe it will be possible to offer customer support over Twitter, the big question will be how this can be formally delivered. So what about some others? MagnersUK for example are dealing with their users as "fans". This not only helps the people connect with the brand in a kind of "matey" way but also allows them to get more a definition of what the punters actually want. They also made a coup last week by sponsoring a #cozytweetup event that had been run in a London park. The purpose of the event seemed to be to connect likeminded people who shared a common interest in Twitter Now from what I saw and what seems to be said since, there appeared to be a fair few influential people at that event. It has been talked about heaviliy and to get you brand associated with something like that must be a plus. If you want to see for yourself, simply see the realtime results for tweets associated with this event --> click here . So where is it all going? I will continue this subject at another time but in short, I think that the trick to staying ahead of the Twitter brand competition will be to make sure your model scales. The big thing I think people like about Twitter is that there is always (usually) going to be a real person on the other end of the tweet. If this is to continue then the human resource needs to be considered as well as any fancy and fandagled tools which may be developed. Tweet smart as some people may end up putting it.